It’s that time of year when downstate film fans should head on over to the state capital, a junction for the fabled Mother Road which gives its name to a cinema showcase worth supporting. Go see for yourselves starting at 10 a.m. today, Saturday, September 19, at the Hoogland Center for the Arts, 420 S. Sixth St., Springfield, IL, when the eighth annual Route 66 International Film Festival commences the public portion of its activities. (Pass holders and festival friends earned extra kicks with bonus screenings on Wednesday and Friday.) It seems like R66IFF sneaks up on C-U Blogfidential every year even though we always know it’s coming, but we’re doing our best to give them the credit and coverage they deserve. Even if that means sleep is not an option on our end. 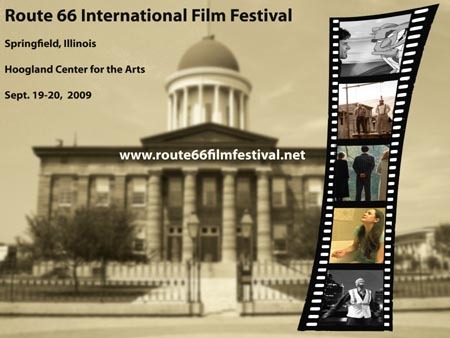 To keep it snappy, we’ll direct you to the official R66IFF Web site for the nuts and bolts as well as this posting of the entire 2009 film schedule at the Illinois Times film pages. Following the poster graphic and jump, we went ahead and replicated the basic schedule for today and tomorrow, Sunday, September 20, for your convenience. Consider joining festival director Linda McElroy along with Meredith Dumyahn, Cameron Counts, and the rest of the R66IFF gang for some world-wide movie discoveries you might not otherwise get a chance to check out; they’ll leave the projector light on for you. Procrastinators like your humble editor can expect the following exchanges to take place at R66FF: festival passes (if they’re still available) run $50, one-day passes cost $25, and single session tickets can be yours for $10 (adults) and $7 (students). A SHORT FILM ABOUT LOVE; SINNERMAN; PERSPECTIVE; IN THE DARK; LETTER HOME; BUSINESS AS USUAL; AND SEVEN HOURS LATER*; THE LAST LEGEND. SAFE HAVEN: THE WARSAW ZOO; HEART SUTRA. SKYLIGHT; THE BRO PACT; I AM A MAN: FROM MEMPHIS, A LESSON IN LIFE; CANTATA IN C MAJOR; HUSH*; REPAIRED? ; SCARECROW; THE BIRTHDAY PARTY; CAUGHT IN PAINT; THE 2 SONS AND THEIR CROGZOOKIES; SEE YOU NEXT FALL*; APPLIANCE NIGHT OUT*. BATHTUB OF HAPPINESS; SOAP; FOET; LIMINAL. HIDDEN HEARTS*; OPEN YOUR EYES; THE PARADIGM SHIFT; DIXON’S GIRL; THE ORCHARD; ROBERT SHAW*; RUNAWAY; THE DYING WESTERN. BURN DOWN; LIVE FROM NEW YORK. This entry was posted on Saturday, September 19th, 2009 at 3:13 am	and is filed under Area Festivals, Public Events. You can follow any responses to this entry through the RSS 2.0 feed. Both comments and pings are currently closed.